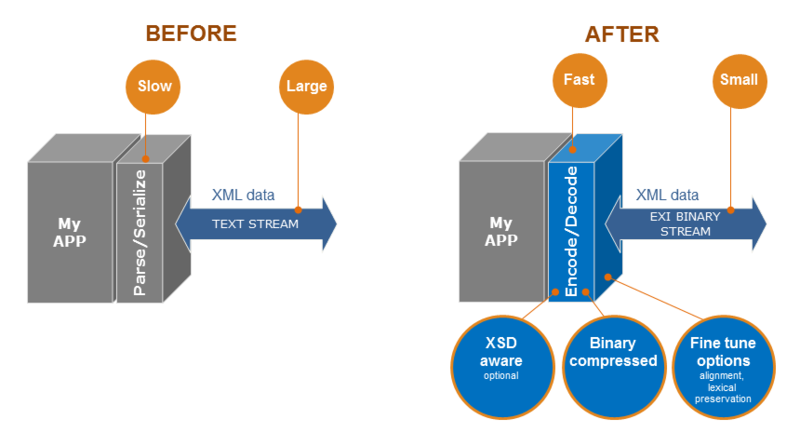 Achieve unprecedented compactness for your XML data using OSS Nokalva's EXI Tools for C/C++. The OSS EXI Tools for C/C++ are a set of tools that implement the Efficient XML Interchange (EXI) Format 1.0 (Second Edition) W3C Recommendation. The OSS EXI Tools for C/C++ enable C/C++ applications to read and write data streams conforming to the Efficient XML Interchange W3C Recommendation. The OSS EXI Tools for C/C++ have been tested with the W3C EXI interoperability test framework. the EXI/C runtime library (ossEXIc.dll). The schema preprocessor utility is a command-line application that reads an XML schema and produces a serialized schema file. The schema passed as input to the schema preprocessor must consist of one or more schema document files conforming to W3C XML Schema 1.0. The output is an XML file (the serialized schema file) conveying information extracted from the schema and represented in a proprietary format, which is understood by the EXI/C runtime library. The schemaless mode of EXI does not require the use of the schema preprocessor. The schema preprocessor relies on the XML schema parsing capabilities and on the XML Schema Object Model of the .NET framework (version 4.5 or later). The .NET framework is required only by the schema preprocessor. It is not required or used by the EXI/C runtime library (see below) and therefore it is not required on the target system. The EXI/C runtime library is a native Windows DLL that is used for reading and writing EXI streams as well as for converting XML documents and fragments to EXI and EXI streams to XML. Trial the EXI Tools for C/C++ today!